Once your baby is rolling, turning and moving about he will push up on his arms and knees and eventually start crawling. It is essential to ensure your home is child-proofed by then to enable your baby to explore freely without restriction in a safe and clean environment. As soon as your baby starts moving about you will need to be meticulous about floor cleanliness as babies put pretty much anything in their mouth. Dangling wires, sharp cords, food crumbs, pebbles, loose change, buttons, anything that may have been dropped on the floor that could be a danger to them needs to be removed. If your house has stairs, exposed electrical fittings, cupboards or drawers which can be pulled and opened, all these require child proofing to keep your little one safe and happy. Once babies start crawling they usually progress quickly onto more advanced activity and will surprise you with their mobility. Set up a safe environment in your living room or nursery where your crawler can experience moving on different surfaces, exploring one space after another with out restriction. 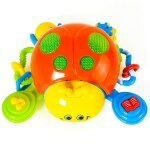 As they master their crawling ability you can introduce fun toys and activities, e.g. 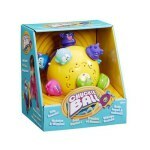 a rolling ball, an activity toy or a moving automobile, which they will enjoy chasing. 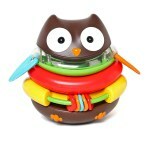 Most babies master crawling skills between 7-10 months. Think of this from a child’s perspective and put away your daily work and get down on the floor and hang out with your moving baby. Observe as your child learns to manoeuvre up and down or cruise round furniture. 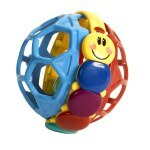 Any stacking toy is a good investment as children can play with them when sitting, crawling, grasping and when lying on their mat. They can be used for colour recognition as they get older.